Be Dazzled Beads is a community of Creatives. 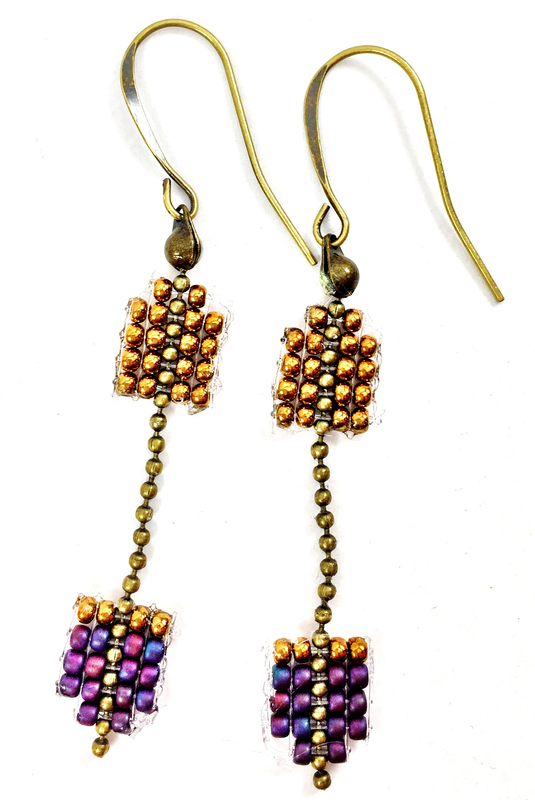 Some people use our beads to make jewelry. Some to do mosaics. Some to adorn and embellish costumes. Some to enhance things like wine classes or drapes or mirrors or sweaters or cross stitch patterns. Some to embellish paintings or sculptures. Some actually use our beads in science experiments. To us, all Creatives are Designers. That is, they make artistic and functional choices about how to incorporate the types of supplies we sell into personal visions. Some design for themselves. Some design for friends and family. Some design as a business. It is not as much fun to work alone or isolated when you realize you are part of the larger Be Dazzled, Land of Odds and Nashville communities. We can learn a lot of insights from each other. We can support each other. It’s all about Connection! Tony comes from a family that was very arts-oriented, and very supportive of him pursuing the arts and crafts — wherever it took him. His mom was a watercolorwatercolorist and oil painter. His father was a small business owner as well as a photographer. His dad’s dad sculpted for Lockheed, and even was a street dancer. He had a great uncle in New York who had a jewelry business, and Tony remembers, even at age 5 or 6, his uncle was always making jewelry for everyone in the family. Starting out with gymnastics, Tony graduated to dancing (because his older sister danced). As a dancer, he had to teach himself to sew for costumes as his Mom was much better with a glue gun then a needle. He remembers his family always making things — food, pastry, lapidary, painting. He has fond memories of always being surrounded by art and creativity. 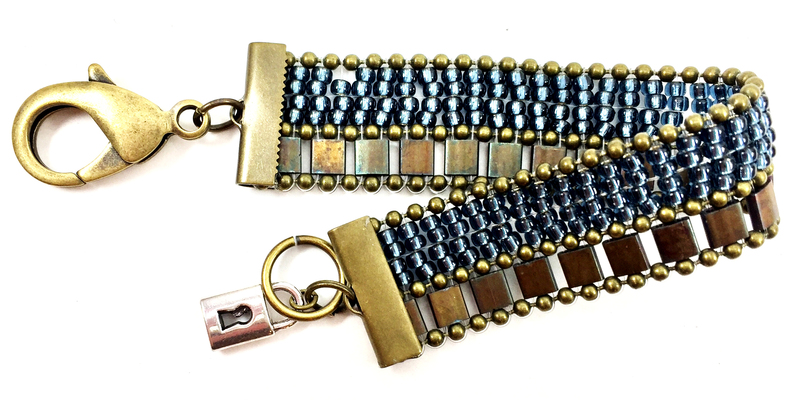 A family friend — Frank — taught him how to bead weave the summer he was ten. That Summer Frank and his wife exposed Tony to the artisan craft as well lapidary, jewelry festivals and much more. As many designers are, Tony is self taught. Tony grew up in Los Angeles, spent some time pursuing a career in fashion in New York City. He moved back to Los Angeles for a few years. And then he came to Nashville with his wife who is a singer-songwriter. Today Tony wears several hats: Jewelry Designer, Dance Educator, Choreographer, Costume Designer, Jewelry Design Educator. Tony continues by describing his core consumer. Tony’s first piece, done around 1998, was a custom piece. He was asked to design a piece for the head designer at Betsey Johnson, a New York fashion designer of clothes and accessories. 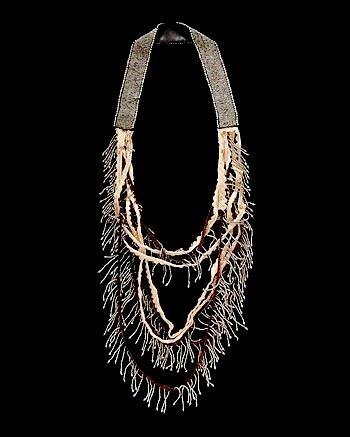 It was a loomed piece, 1 1/2″ wide choker with multi-colored skulls in it and dangling feathers. He was excited, to say the least. He shared the story about making this one piece, which inspired other people to ask him to design a piece. People responded to his authenticity, and then it became all about the product. 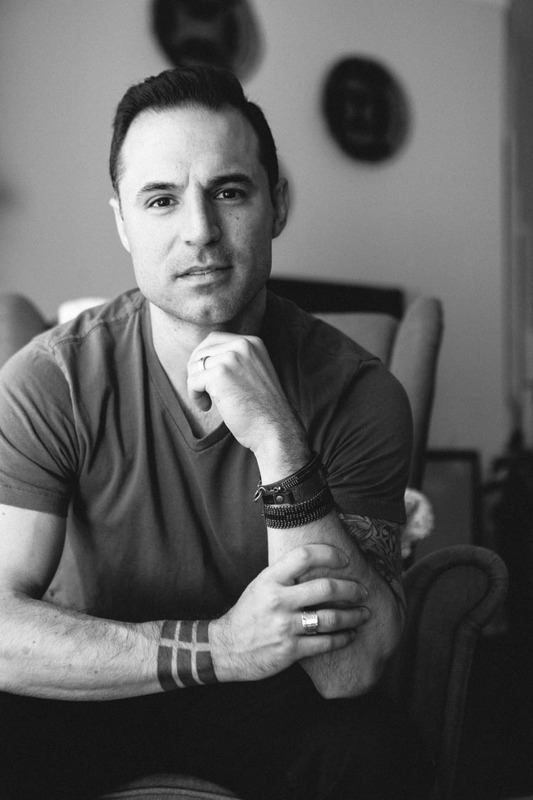 When Tony moved to Nashville, he decided to focus on jewelry. It was part, what was he going to do to make a living? 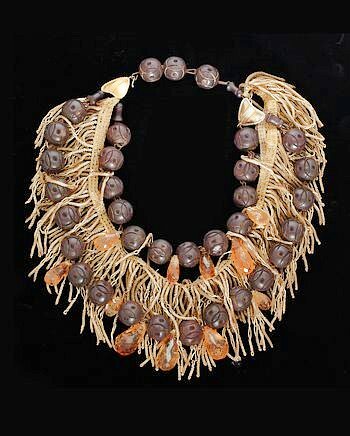 Part, honoring his childhood mentor who had made the Indian jewelry. 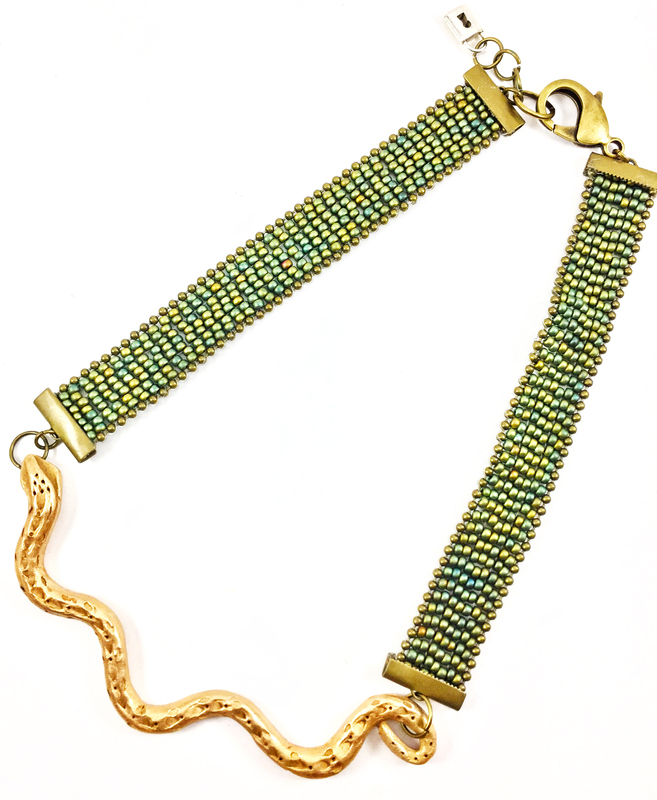 Part passion about his loom, and gradually adding precious metal clay to the mix of media he relied on for his jewelry designs. Tony:“And I still love it. Exhausted. Up until 3am getting production ready. Fingers chewed up by my drill bits. But I absolutely still love it! Tony mentions that, to understand his creative process, you have to go back to his goal of trying to meld together all his creative worlds. His creative process is not a linear process. 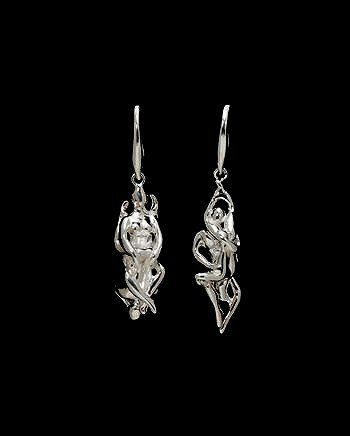 He cites as an example a very successful pair of earrings he designed which are precious metal clay based. But they were flowers, which is very specific seasonal iconography. When he started thinking about what he wanted to do the next season, he thought about how he could adapt these earrings. 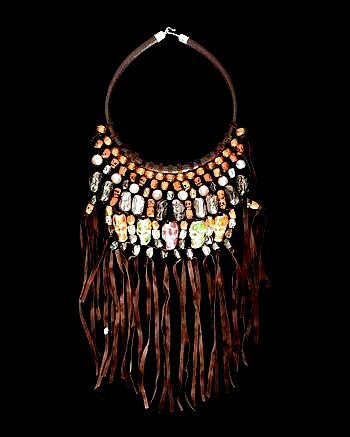 He mentioned that a lot of his pieces and his bead weaving have an almost art deco or art nouveau feeling to them. At the time, there was an Egyptian revival style that was prominent because of a world wide tour of Egyptian antiquities. He reflected on his artistic style and the current revival trend, and asked himself: This was a successful piece. I’m thinking business here. How do I creatively then come up with the next version of it? So for the Fall holiday he explored hieroglyphics and lotus flower motifs. And for the following Spring, he thought about incorporating the scarab and other Egyptian touches. Tony discussed that jewelry artists have to be able to synergize the Business-Creative Mind. Both worlds need to be respected. It’s a hard business, he agrees. Artists have to monetize their creative output and still remain authentic to themselves. Frequently, he asks himself: Do I need to break up with my design? It is OK, he indicated, to say Yes! His scarab beetle was a good idea, but some reality testing was in order. Was it too early before the trend? Would it be marketable? On a second business level, Tony poses the question: Can I stand behind my product? Can the store that sells his pieces be able to stand behind his products? A third major consideration is whether he has successfully differentiated his products from the mass market. 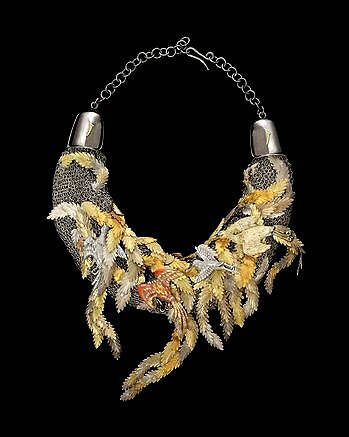 That is one reason he incorporates glass seed beads and Czech beads within his work. 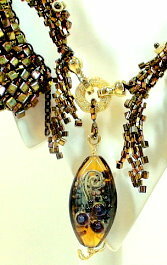 Glass beads allow him to inject colors, where more mass market pieces are mostly metal and look very machine made. 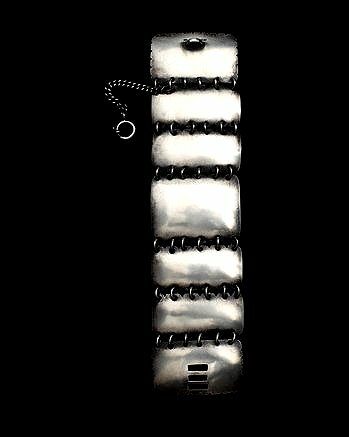 Tony reflects daily how art jewelry, as opposed to jewelry mass produced overseas, will be accepted by the general public. He sees that consumer demand for artisan jewelry is on the rise, but there are still nagging questions whether you can make a viable business out of it. Can you make enough product? Can you do it efficiently? 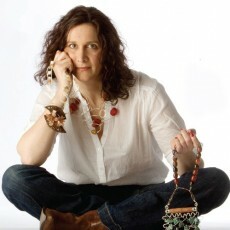 Can you transition from a one person designer business to having staff make the pieces, as well? Meeting business goals gets more complicated if you are not going to produce your jewelry overseas. One of his biggest challenges coming up is to create sufficient infrastructure — studio space, supplies and personnel — to be able to easily kick out 30 pieces of 20 styles on demand. Tony is natural marketer, so I asked him what kinds of things he does to reach his target audience. The extent of things he does can provide a lot of ideas and insights for all of us. The big questions before him: How does he meet demand that he has created for his jewelry? How does he enhance his brand? How does he grow his ability to distribute his products? He wants to contine to be flexible, given the instability of our economy. He wants to maintain his constant rate of sales so his business can sustain itself. He sees, perhaps, his line represented in a showroom. Perhaps he can gain more presence in museum shops. Tony has had to create the opportunities himself. This has involved a lot of reflection, reality testing and planning. He has created a business plan framework with year over year goals for design, production, and distribution. 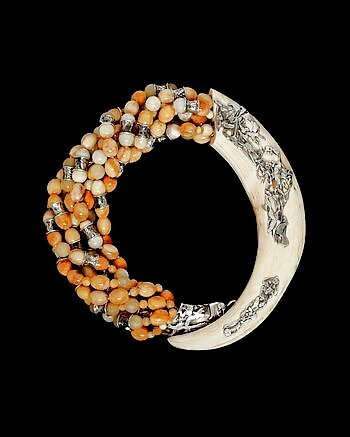 Tony wishes there was more of a connected jewelry designer/artist community in Nashville. It is still very fragmented. He finds that politics gets in the way of creative collaboration. He wants to call artists attention to the Arts and Business Council of Nashville, as well as their Periscope program. There are opportunities for networking, expanded contacts, a support system of creatives and their ideas, developing business skills and confidence. Jewelry designers in Nashville still need a more functional, consistent support system, particularly to thread the business-needle better. Help to find studio space. Getting a small business loan. Finding an angel investor. Connecting to mentors. This is all important, and we need more organized systems to make these kinds of things easier, smoother and more reliable. Tony has taken a shot-gun approach to getting his jewelry out there. He does a little direct retail through an e-commerce site. He finds that this is a great billboard for him, but not a great selling outlet. He does art and craft festivals. He likes to focus on juried or well-curated shows in particular. He wholesales his products to stores. Sometimes this involves cold-calling on stores, with product in hand. But he also does wholesale markets, like the Atlanta Gift and Apparel Market. In 2017, he did 2 shows there; in 2018, he plans on doing 4 shows. 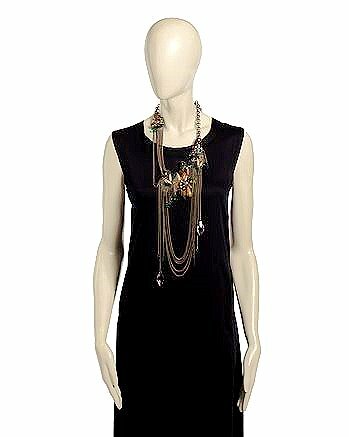 His pieces currently are in 28 stores in the United States and the Virgin Islands. He is looking at other wholesale markets. He is exploring options to lock in with a jewelry rep or a jewelry show room. Tony has an eye out to find his ideal studio-showroom. He pictures it full of natural light. Small and intimate. A low wall separating the front from the studio. Inspirational and calming. A sancturary. Visit BE DAZZLED BEADS online to view our classes, jewelry clinics, mini-lessons, and jewelry design discussion seminars! Question: How do you go about figuring how to price your jewelry? 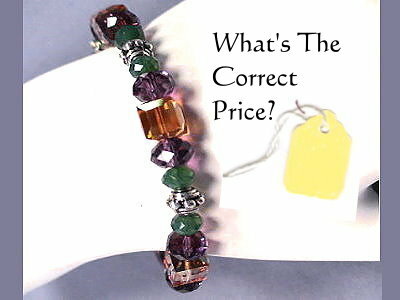 I teach a class on how to best price your jewelry, and I have posted a video tutorial on the CraftArtEdu.com website. There are different kinds of pricing strategies. (1) One type of pricing strategy is called “Keystoning”. Keystoning is where you multiply your costs by 2, to arrive at your price. If your costs were $10.00, then your price would be $20.00. In the Jewelry Industry, you will hear a lot about Triple Keystoning. Here you multiply your costs by 3. To arrive at your price. So, if your costs were $10.00, then your price would be $30.00. Keystoning works well if you are a boutique or gift store buying finished jewelry. You would double (keystone) or triple (triple keystone) the costs of each finished piece. Keystoning, as a pricing strategy, works well when you are dealing with finished goods. The price is simply a multiple of the cost of the Parts. Keystoning assumes that Labor and Overhead costs have already been factored into the cost of the jewelry. Keystoning is a little more awkward to use, when dealing with manufacturing goods, like most jewelry designers do. Keystoning tends to over-account for the cost of the Parts, but under-account for the costs of your Labor. Keystoning works well for jewelry stores. Keystoning does not work as well for jewelry designers. Here, based on your gut feelings, you would set the price at the highest price you think someone might pay for your piece. You will see this strategy employed in a lot of tourist areas. Businesses in tourist areas usually pay very high rental rates. They are often dependent on making their money in a very defined seasonal timeframe. They assume they will they will never see these customers again. At the point of sale, the customer goes away happy and the business goes away happy. However, when the customer goes home, and they show their purchase to their friends or family, or shop around, they begin to realize they overpaid. So, over the medium and long term, the customer is no longer happy. An unhappy customer can spread bad word of mouth. While that particular customer may never revisit that tourist area. They might convince their friends and families, who may plan a visit, to avoid that particular shop. (3) The third type of strategy is called “Fair Value”. This is what I teach in my class, and is detailed in my video tutorial. ‘. Overhead costs include things like rent, electricity, wear and tear on tools and equipment, telephone, travel – basically everything else associated with making and selling your jewelry. You gather cost information on your Parts and your Labor. You estimate the Overhead costs based on percentage of your Labor and Parts costs. This gives you a range of fair prices from which to choose. With a Fair Price, you may not get the highest amount you possibly can get, but you will get an amount that more than covers your costs, and leaves some money left over to spend on yourself, or re-invest in your business. With a Fair Price, when you sell that piece of jewelry, both you and your customer go away happy. And both of you stay happy. I recently came across an article Andrea Rosenfeld had written about Creative Mentoring. I thoroughly enjoyed the article, her extremely clear and accessible writing style, and was very interested in taking a little internet road trip to her website. How do you take your passion and your art work to an audience? I deal with this type of question from our students and customers almost every single day. She offers many ideas and many services. I suggest reading some of her articles are articles by “visiting creatives” for special insights. Is Your Website Scaring People Away? The “What Do You Do?” Game. How Would You React to Common, Uncomfortable Online Situations? Should You Create Art or Create to Sell? Who is Your Customer, Who Are You? Would You Dance? *how do you handle adversity? Look Up! You’re Missing Life! “Avant-garde” means at the leading edge or vanguard. 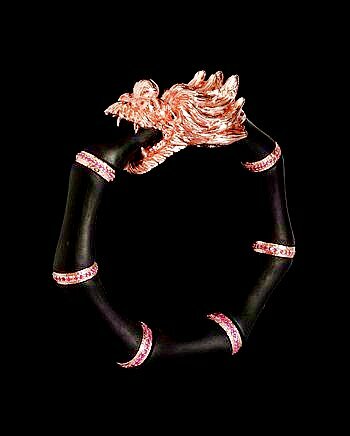 It is a label associated with jewelry that is more experimental, more innovative, cutting edge, resonant. There is something witty or unusual. There is something that gets people talking about the pieces. 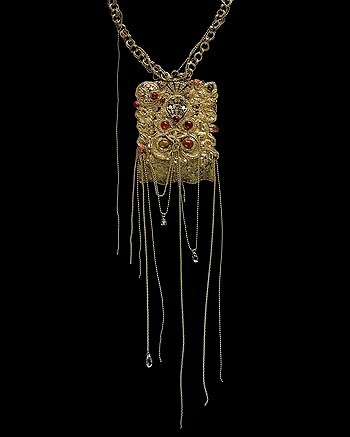 CoutureLab represents an ever-evolving stable of avant-garde jewelry artists. These are artists that other jewelry artists and galleries talk about. They sell to upper end clients who want to associate with the hip and new and artsy. While you may not personally want to be “avant-garde”, an exploration of these artists’ works is a great learning experience. 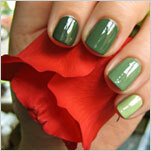 You learn about color combinations, balances and proportions. 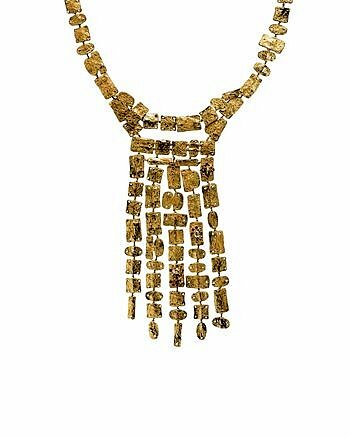 You learn about new jewelry profiles — that is, how to shape jewelry relative to a person’s body. You learn new techniques of construction, new materials, and combinations of these things. 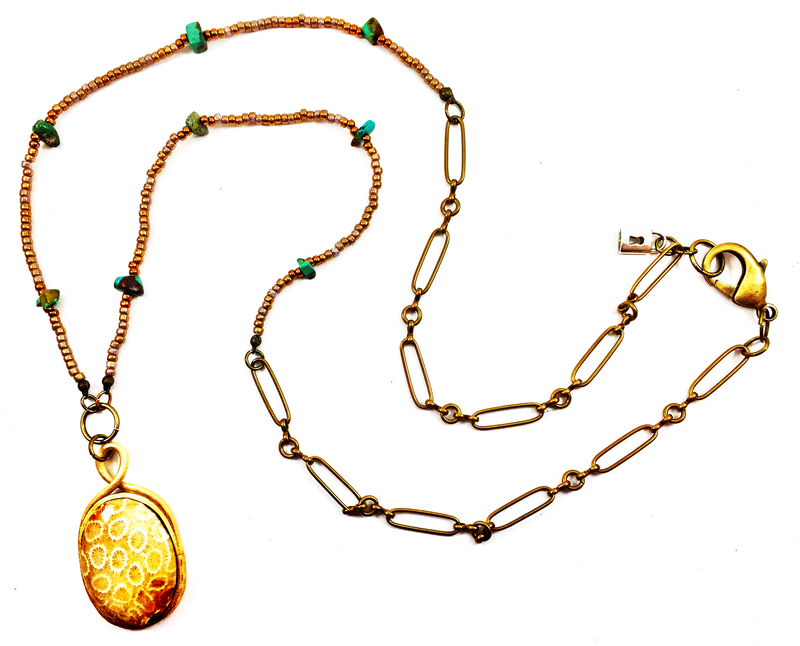 Viewing the works of these kinds of jewelry artists is a great way to stimulate new ideas within your own work. It is also useful to explore some more of the “details.” Visit the CoutureLab website, and look at the prices for the artists’ works. In your mind, determine how the price might relate to the amount of work and the cost of materials. How much of the price might relate to the artists’ reputation? In some cases, there seems to be a good match between price and object. In other cases, some prices are rather low, and you wonder how the artist can make a living selling jewelry. In the CoutureLab website, very few pieces, to me, seem over-priced. 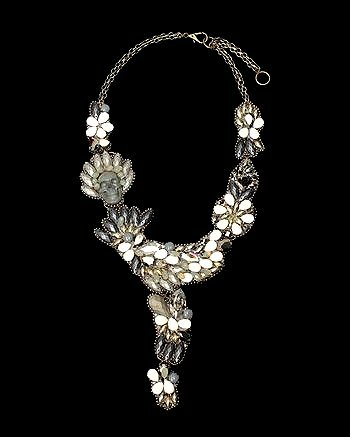 Another good research -exploration is to examine the jewelry artist’s website. How is it organized? Is there an excessive use of black backgrounds and flash-utilities (allows movement, almost like watching a slide show or movie)? A black background makes the text hard to read. Flash looks fantastic, but the average customer’s computer often locks up, because of flash utilities. Is the information organized well? How about the navigation within the site? Do the images sufficiently convey the details about the pieces? How distinctive and memorable is the website? Also do a Google search on the artists name. Ideally, you would want the artist’s website to be at the top of the search list. When it doesn’t appear at or very near the top, you need to wonder about the artist and their long term survival. Here are some of my favorite artists currently represented by CoutureLab. COUTURELAB: “A graduate from the houses of Ungaro, Ricci and Dior, the couturier fuses his playful imagination and technical affinity to create a joyful and dynamic universe. 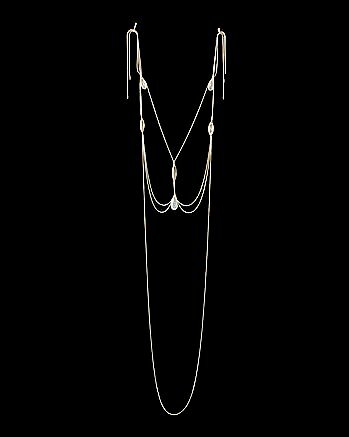 … What adventures will you attract in Alexis’s “Black Mischief” art-deco style necklace? 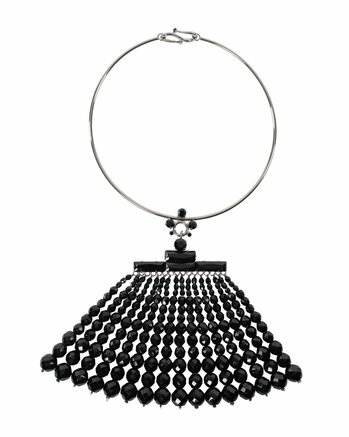 Faceted black crystals – precisely graded in size – hang in delicate suspension, catching the light with your every move. Emerald and round-cut crystals, claw-set in lustrous white metal, form the complementing cluster at the top of the pendant; a silvery hoop with ornate hook clasp secures the piece around your neck. With a financial crisis in full swing, it has become more difficult to sell your jewelry. 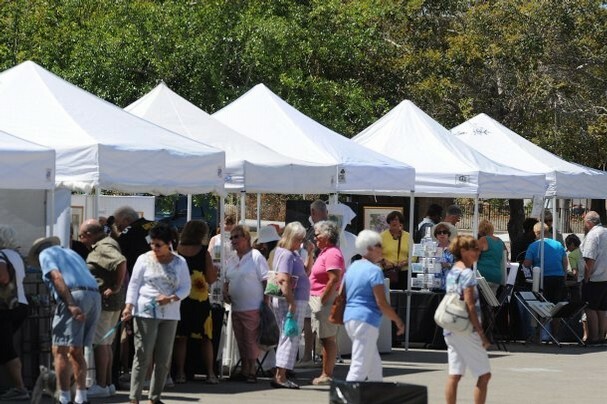 Fewer stores, fewer customers, fewer craft shows. 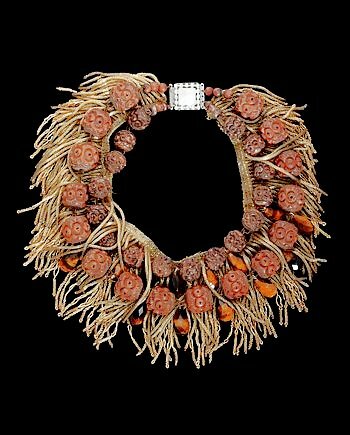 At the same time, the costs of all the supplies – beads, stringing materials, jewelry findings – have been increasing at much faster rates than inflation. This adds to the problem. At the same time, it is getting more difficult to get your “message” to your “customer.” With things like blogs, facebook, my space, twitter, other interactive sites and social networks, people are organizing into ever-smaller market niches. It’s too expensive and too time-consuming to get enough people to be aware of your business, that you can continue to make a living. They are no longer reading the mainstream magazines and newspapers to get their primary sources of information, to the extent that they have in the past. They are not going to local craft shows or local stores as much, because they have an online world of Etsy and Ebay and 26 million jewelry sites listed on Google. Perhaps these times and prospects can be reinterpreted as an opportunity to rethink how you approach your jewelry selling business. At the least, perhaps you can better secure your base during these times, in preparation for more growth and expansion as the financial crisis bottoms out, and then gradually improves. It’s time to take a hard look at your “business model.” You have probably been operating as a one or two person operation. You, or both of you, do everything. You create the designs. You make the jewelry. You market and sell your jewelry. You wear many hats. “Unbundling” is a strategy where you give up control of some business functions, and rely on the expertise of other companies or organized groups. One obvious thing is to rely on UPS or FedEX for your shipping needs. I suggest you think about no-cost and low-cost ways to unbundle some of your marketing and promotion. One inexpensive and effective way is to get a regular group together of others who sell hand-crafted jewelry or other hand-crafted items. On one level, you give up some control in managing these aspects of your business. On another, however, you get to leverage the talents and time and resources of these other businesses. This might be the smartest way to continue to reach your customers, and continue surviving and thriving when things are tough, and the business environment keeps changing and evolving.